A child is being physically abused by her alcoholic mother at home. A school nurse discovers it and sees that both of them get help. 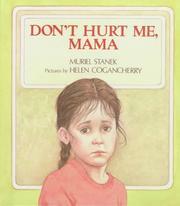 Stanek, Muriel, “Don't hurt me, mama,” Children's Picture Book Database at Miami University, accessed April 18, 2019, https://dlp.lib.miamioh.edu/picturebook/items/show/6376.